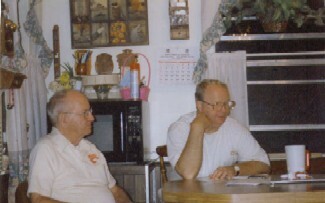 Above: Tommie Rowell with son, Jamie, sitting at his kitchen table talking about old jingles and tunes his Granny Baysinger would sing to him as a child. while the jaybirds whistled and the buzzards danced." Granny Baysinger was a Cherokee Indian raised with an Indian tribe in Rosebud and Sercy, Arkansas. 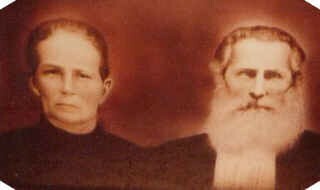 Her family had been part of the "Trail of Tears" forced march of Indians to Oklahoma and Arkansas in the 1830?s. 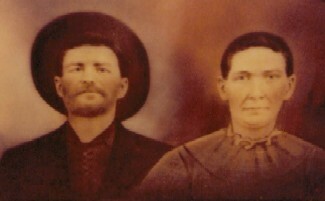 Her father was Columbus House and her mother was named Cornillia House. She would have been from North Georgia or the Carolinas. 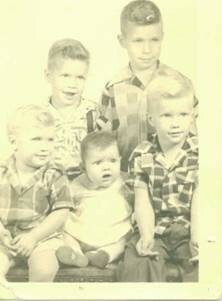 My daddy was born in Jamestown, Louisiana and grew up there on the farm of his father, Johnny Carl Rowell. At the age of 16, his father gave him a patch of cotton on the NW side of the house which sat on 48 acres. The patch was one acre in size, made one bale of cotton, and sold for $.32 per bale at 480 lbs. weight after it had been ginned and baled. His daddy paid for him to go to Shreveport to trade school and gave him $5.00 each week to stay. He had to pay $10.00 each month for room and board. At the vocational training school, he took a wielding course and graduated after six weeks. The instructor wrote Higgins Shipyard in New Orleans and set up an appointment for him. He caught a train to New Orleans in 1942. Upon his arrival in New Orleans, he paid $5.00 for a room. The next day he passed a wielding and physical test at Higgins and they hired him at $.60 per hour. But, they would not give him a raise untilhe was 18 years old. After doing some calculating, he figured he would loose money, so he caught the train back to Shreveport where he went to his older brother O.D. ?s house where he spent the night. The next day, he went to Bossier City to Kickapoo Tourist Court where he got a job waiting tables and cleaning cabins. He also worked the switchboard where calls were $.10 each. Behind the counter, he noticed that condoms were sold and that they were cheap. He also noticed several pretty women would come into the motel each night, and he quickly realized the women were prostitutes. Unfortunately, the motel burned down after four weeks. Because he was making only $5.00 per day, he decided it was time to move on. Besides, even though he was receiving free room and board in one of the cabins, he often had little money left for a good meal and spent his nights eating a sandwich in the room with roaches that also occupied the room. He found that the Kickapoo Motel on Mansfield Road was hiring a service station attendant, so he went there and got the job, pumping gas. Gasoline was rationed during the war and an #A ticket would get you three gallons of gas at $.21 per gallon. A #T ticket got Five gallons. One night while gassing cars, a woman pulled up and asked for a restroom. He thought she asked for a whiskbroom. He told her, "No, but if you?ll raise your leg, I?ll blow it out with this hose!" For entertainment, each Saturday night he would go to the Louisiana Hay Ride in Shreveport with Troy Woods, a fellow employee of the Kickapoo and who was from Tar Hill, Louisiana. One night at the Hay Ride, he saw Shirley Ann Norman, a fellow student from Jamestown. She was with a very pretty girl named Dorris Christine Padgett. And, it looked like Dorris had a boyfriend. Fortunately, he noticed the boy had thrown up on Dorris. ( Of course, Dorris says they were with Shirley Ann?s brother and his friend, not her boyfriend.) 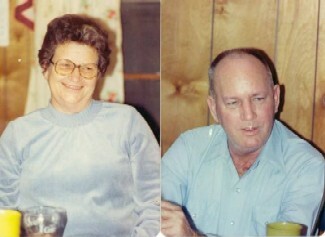 When the boys went to the restroom, he made his move and went over to talk with Dorris and Shirley Ann. That was his first conversation with Dorris, and he asked her out. She accepted. That night he caught the trolly home. On the ride back to the motel, he looked over and told Troy Woods, "That's the girl I?m going to marry!" 7255 visit[s] to this page.